Yesterday I bogged about the new practice bubble. They're actually pretty nice---and functional, which is the point. This article is about the bubble installed at Columbia. It has a video and an image gallery. 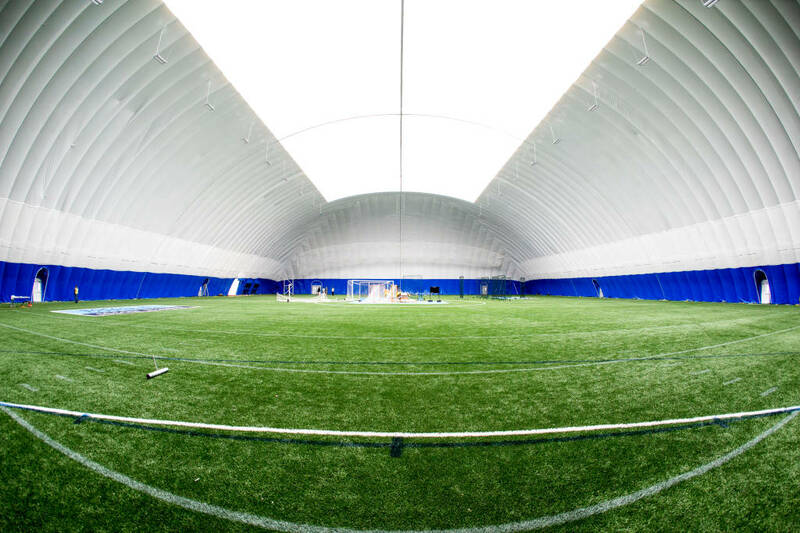 This article is from "Athletics Business" and is about maximizing field use and budgets using seasonal domes. Its got a video of the setup of Harvard's bubble. The sound track is pretty annoying and it starts slow, but hang on to the end when the bubble is lighted, then it's pretty impressive. On a cold dreary January or February day the UMass coaching staff can show recruits the lighted bubble and it will make a difference. The bubble will also show the AAC, should there be a conference realignment, that UMass is investing in the program. 247Sports has a post on ten running backs looking to build off their freshman season. One of them is A.J. Dillon, and the Minutemen are sure to get a big dose of that action on September 1st. Speaking of BC, "BC Interruption" talks smack about the Minutemen. Every year, "BC Interuption" brags about what a great year they're going to have and every year they fail and end up as "also rans". Before Mr. Black starts ripping Coach Whipple, he should learn how to spell. Saying Whipple only does "have his job"! Really Mr. Black! That's elementary school grammar, you dope. Then they claim UMass puts together a "powder-puff" schedule. Pretty sure our schedules have been tougher than theirs and we haven't scheduled TWO FCS opponents in the same year. And saying we can qualify for crappy Bowl games...they should know. BC hasn't played in a big Bowl since Flutie took them to the Cotton Bowl in '85. Speaking of Bowls, BC's 14-12 record in games isn't something to write home about. What excuses will "BC Interuption" come up with when we beat them? Stay tuned.